Good morning my lovelies. Another grey day is here and I've spent the morning going to the trash station sorting my garbage and cleaning up after yesterday's neglect. 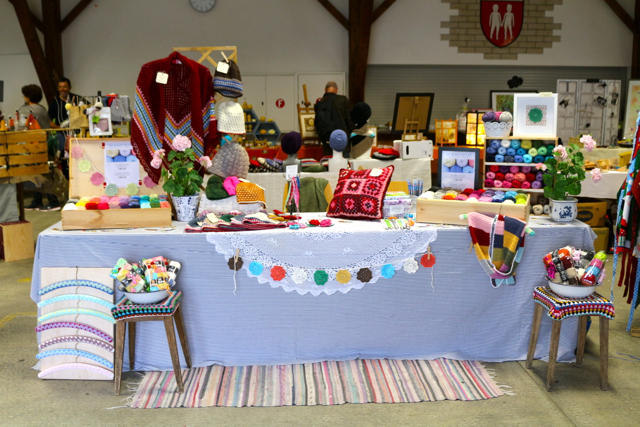 I thought I would share some photos from the local Artisan market I attended last weekend here in my home village Gimel. My stall looked lovely. I'm not afraid to say it was the finest stand of all. Because it really was. Placed right at the entrance this is what you were welcomed by - a My Rose Valley, Scandinavian Homespun delight. The rag rug was in place as well as samples of my Nordic Shawl together with lace and country style blue stripes. 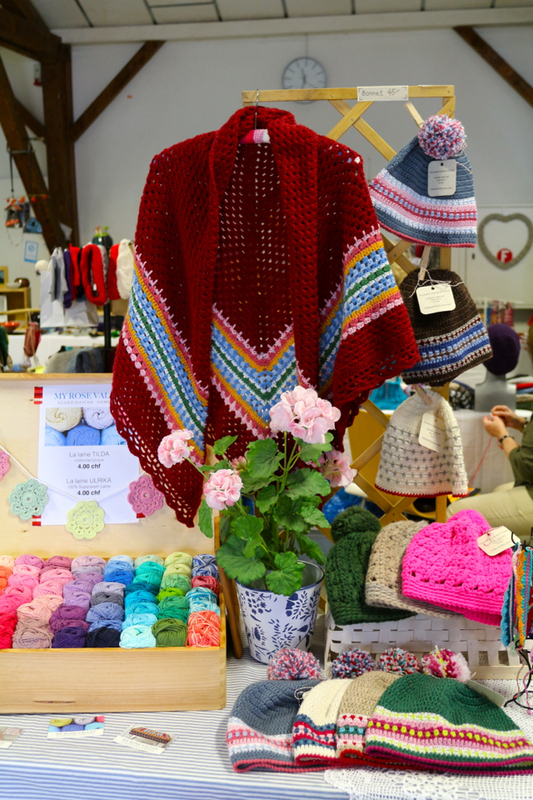 There were Nordic Hats, Nordic Wrist Warmers, Maybelle garlands and Tilda and Ulrika yarn for sale. And some colorful bracelets made in the least minute using byClaires neat little pattern. I had hopes. It didn't go so well and looking back at the last time I did this I now know I won't do this again. The farmers in my village are not ready for modern crochet. The locals don't come here to shop. They come here to talk. Chat to neighbours and friends, have lunch at the Buvette where they serve hot food, cakes, coffee and wine. Every vendor suffered, not only me. I did it. I was there. I learned my lesson. And if I ever consider do this again next time around in 3 years from now I hope I go back to read this blog post to tell myself to not put all the effort in. It is just not worth it. Enough of the whining but unfortunately this is reality at craft markets. I believe it is all about finding the right market with the right audience if it is going to be fruitful for you as a vendor. Saying all this I'm not giving up. I'll keep going with My Rose Valley worldwide. That is where my audience is. Not here in little hidden Gimel up in the Jura mountains. your stall looked very beautiful! loved that shawl? think it's much the same anywhere especially in the country. To be honest I think only online works - unless your work can be sold within an upmarket shop and that cuts profit margins right down. I don't think there is any suitable permanent market place for the single seller. They don't have/can't have enough goods for a shop of their own and it would be prohibitively expensive. So handmade gets stuck with 'market' as a place to sell. Unfortunately markets are the place people go to get a bargain from, to find goods at rock bottom prices. There is something unstable about them. The means for display are usually pretty basic, enabling people to set up quickly and dismantle quickly. I think only online are people able to set up shop in a nice environment and to set up a permanent space and make it feel like home. People should be charging more and attracting people who can afford it - to make is not to be cheaper or matching the shops. Craft is time consuming and that by its nature means it is expensive. For anyone who thinks it is too expensive, ask them if they would sit in their office for 8 hours a day and not get paid for their time. Sadly this does means that even though many would like the product, it is simply not affordable for them to buy. I make and sell and I can't afford my own product. There are many things people cannot afford and there is no right or expectation that we should. I was in a shoe shop yesterday that sold wellington boots for £95. Not for me, mine were under £10. But those people could and would buy your items, my friend can afford these boots and she could afford handmade goods unlike me and does sometimes buy them. They probably wouldn't buy from a market, but they would a 'posh' shop. It is sad that nice goods are not available for everyone to buy but that is the nature of our economy and the prices we need to charge to be viable in it. 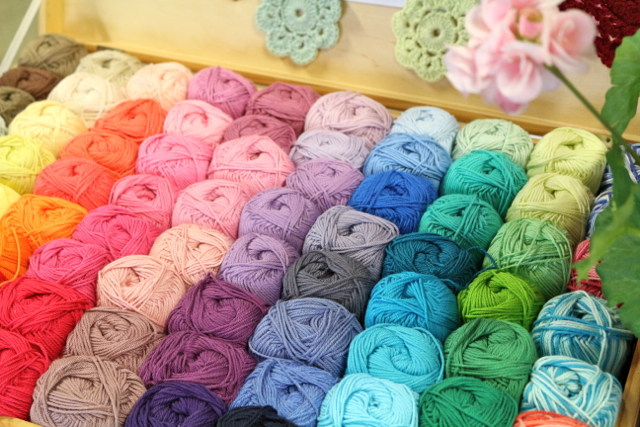 So, factor in how much your items are really worth - not just the yarn and some of your time (or even none of it like many crafters do), but all of your time. Then market to those select few who can afford to buy. I bet even at the prices you do charge, they are too expensive for people who just shop at the local shops. Yet there should be no apology from you as I imagine they are still relatively too cheap for you to make a profit. When I visit craft markets, there are lots of nice things to buy but I buy none of them as even though I think they are cheap for what they are, they are not affordable by me. So I move on. I get by because I make things myself and have the things I want that way. There are people with more money who don't/won't/can't do that and they will be happy to buy from you. In this part of the world buying even the raw materials can be as much as buying new ready made from a high street shop. Customers often don't understand that and will not buy. So, a mixture of things. No reflection on you or your beautiful things. It is just that there is not a great range of people who can both afford them, and who want them. It is very difficult. They will always be most admired though by people who don't want to buy them but make them themselves! The last people you need to impress I know. You do tap into that market too though by selling patterns, which is far more accessible and cost effective for you too. 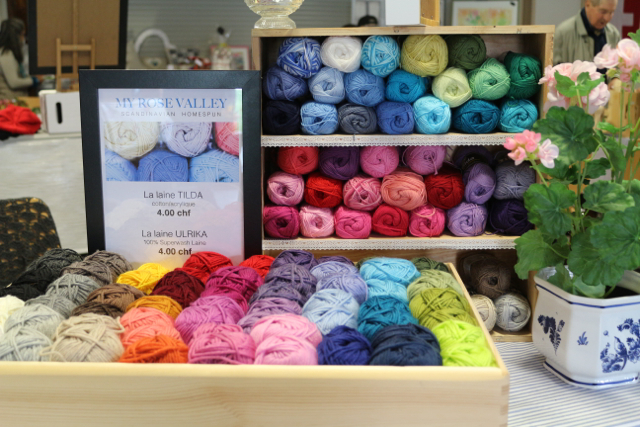 Also yarn, which is a good idea but might be a lot of work with limited profit margins. The other thing (finally!) is that the market is very saturated so there is a lot of competition. Your stall looks beautiful, pretty and colourful. I'll attend my first craft fair this November in my own little village and I'll probably have the same experience as you now had. People like to come over and watch and to chat, to drink coffee and beer. They won't buy. I'll do it because to let them know I have this little yarn business and to show them what I make. And one day, when they need yarn, I hope they remember there's a yarn seller in the village. I feel your pain! I have done a number of fairs, church bazars and so on. It's always something with the buyers at these events....."do you have it in this color?"... "do you have it in this size?"... "can you come down in price?" or...."I can make that"...and so on. Your booth is lovely and marketed so well. Thanks for sharing. I had very good experiences in selling my stuff when we were still in Cairo, where the expat community was huge, while in Jakarta was really hard to sell, because I was not Cath Kidston …. they wanted only big names to show off…. It seems to be the same the world over. I recently went to a big craft fair that runs two weekends every fall for 20+ years (I've even had a stall there years ago and barely made my table fee back.). Although they were a wide variety of handmade items for sale, no one was selling much. It even has a big following and draw from big cities. I've seen where Amazon is now getting into the craft business like Etsy. Your stall was beautiful! I also wanted to tall you that I'm finishing my Gipsy Blanket, thanks to your wonderful pattern, and I'll very soon email a picture to you :)) I never thought I'd be able of such an accomplishment, and I'm so grateful to you ! 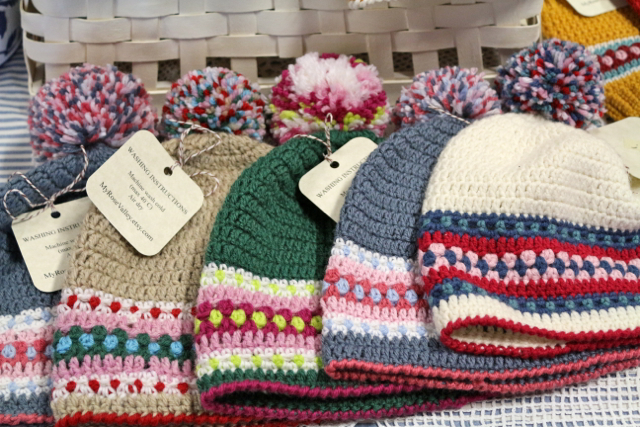 Your booth looked lovely and I would have purchased one of your hats - they are adorable! Lovely set up. I'm sorry sales didn't work out the way you wanted. I had thought about knitting for a local craft fair before the holidays in the city but after the last time i had attended, I believe ppl were mostly look for bargains and the knitwear I saw wasn't up to my snuff. So I've told others I don't feel the effort's worth it considering all the time and consideration I put in. Well, at least it gave you some fabulous photos that you can use in other advertising, lol! 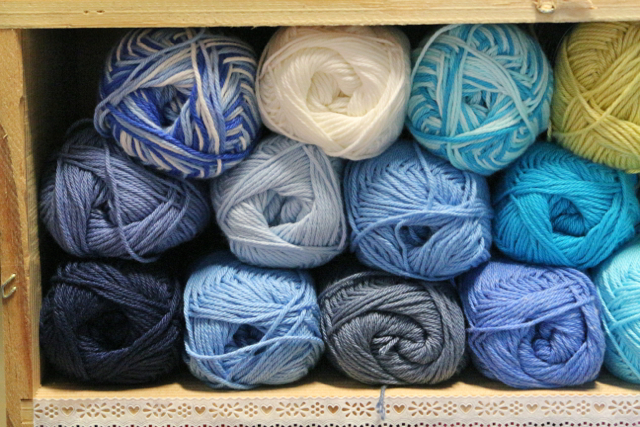 Well if I had been near I would have stopped by and bought all of your yarn. Your stall was wonderful, maybe a bigger market in a much bigger place? Just a quick question. I'm new to crochet and I can't read a chart. Is your Nordic shawl and hat pattern written or just a chart I really would like to make them. 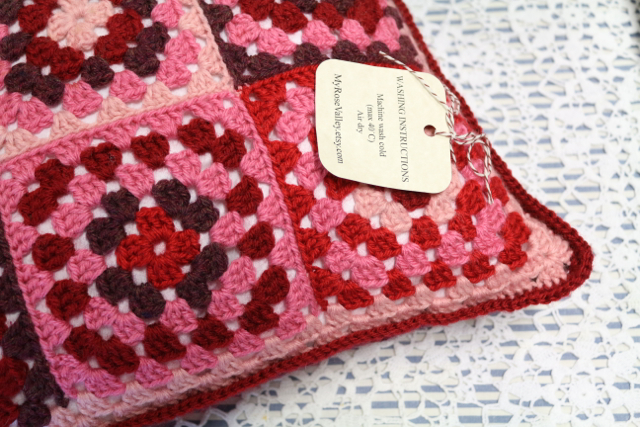 Quanta coisa linda que você faz em amiga.Essa caixa cheia de novelos,sonho de consumo das crocheteiras brasileiras.Beijo.Valéria. Åh så fint! Härliga garn, mönster och mössor mm. Du kan vara helnöjd med din insats och ditt bort. Tack för - alltid - trevlig läsning och fina bilder samt inspiration!